When you reach for your bottles of vitamins or fish oil capsules, you might wonder how well they work and if they’re safe. What you should be asking is do you really need them in the first place? More and more people take multiple dietary supplements daily. Nutritional supplements do not require a prescription and usually come in pill, powder, or liquid form. The most common supplements include vitamins, minerals, and herbal products. People are taking these supplements to ensure that they get enough essential nutrients and to maintain or improve their overall health. But do you need to take all those supplements? Numerous dietitians and doctors believe that supplements aren’t completely necessary but can be useful for filling in gaps in an individual’s diet. Evidence and research suggest that supplements can enhance health in different ways. The most popular supplements filling people’s medicine cabinets are multivitamins, calcium, and vitamins B, C, and D. Calcium works hand in hand with vitamin D to support bone health, while vitamins C and E prevent cell damage and help to maintain health. What if you could reduce the number of supplements in your cabinet that you need to swallow while still receiving all the benefits that you used to get from all of them? That sounds too good to be true! It’s possible though. Celergen makes it possible for you to receive the benefits you get from most of your daily supplements in an even better form. Celergen isn’t just a nutritional supplement, it’s cell therapy. Celergen is a potent Non-Injectable Swiss Cell Therapy Treatment that stimulates your body’s natural healing powers to trigger the repair and rejuvenation of cells by providing biologically active micronutrients and essential nutrition at the cellular level, boosting the production of proteins and enzymes. It supports bone and joint health, and it prevents cell damage. So, you might be thinking, “Hmm, Cell Therapy, I don’t want expensive and painful injections”. Well here’s some good news then, unlike other cell therapies, Celergen comes in an oral soft-gel. That’s not all! You know that not every nutrient you swallow is absorbed by your body. 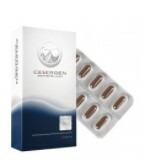 Well, Celergen has been fortified with special double-enteric coated soft-gels and strengthened by superior Anti-Reflux Technology to prevent stomach digestion and ensure that the active ingredients and micronutrients are released only in the part of your body, small intestines, that ensure potent and effective absorption. One soft gel to rule them all. Clear out your cabinet, Celergen is all you need.